Hi guys. Today I’m going to be doing a review on Ninja Professional Blender NJ600, a blender that I feel fits the bill to be called the best blender under $100. There are many aspects when choosing a blender: price, size, material, blender functions and the result of the smoothie that you want. Should price is not a constraint for you, the top industrial grade blenders (Vitamix, BlendTec, Breville) is the best blender that you can get. But for most of us, forking out more than $400 for a blender might be a bit too much. Thus, I’ve compared many blenders below $100 and found out that the Ninja NJ600 is one of the best in this price range. Ninja is one of the more affordable blender manufacturer out there. They make some awesome products that could even rival the industrial grade blenders. The Ninja Professional Blender NJ600 comes with a whopping 1000 watts motor, 72 ounce pitch that is BPA free and 3 speed and Pulse function. Watt is a unit for motor power usage. In essence, the higher the rated power (or wattage) of the blender, the more powerful and better it is in pulverizing our smoothie ingredients. For the sake of comparison, a normal kitchen blender can have a meager ~250 wats only, while the top grade blenders has close to 1500 watts. With its 1000 watts, the Ninja NJ600 is a very good for money product, and can do all tasks just fine from ice blending, to smoothies and to vegetable purees. Just throw the ingredients in, and it will blend it for you. With it’s high power and low price, it’s easily the most cost effective blender out there. To illustrate my point, a top grade blender will cost a minimum of $400 and can produce 1500 watts. That equates to 3.75 watt per dollar (1500 watt/$400). But the Ninja NJ600 costs $78.80 (at the time of writing this review. Please check Amazon’s page to find out the latest price) and produces 1000 watts (equals to 12.69 watt per dollar!). That is 3 times more cost effective than the top grade blenders. Another function that the Ninja NJ600 has is its 3 speed and Pulse setting. The Pulse setting is for controlled processing. Meanwhile the 3 speed setting is for: 1- Mixing, 2- Blending, 3- Ice Crushing. For sure, it can not compete with the top grade blenders: they are more sturdy, blend everything into a smooth texture smoothie, and have much more function. They also come with 5 years and above warranty. But if your main purpose is to whip a smoothie once a day for yourself or your family, there is nothing wrong with this blender. 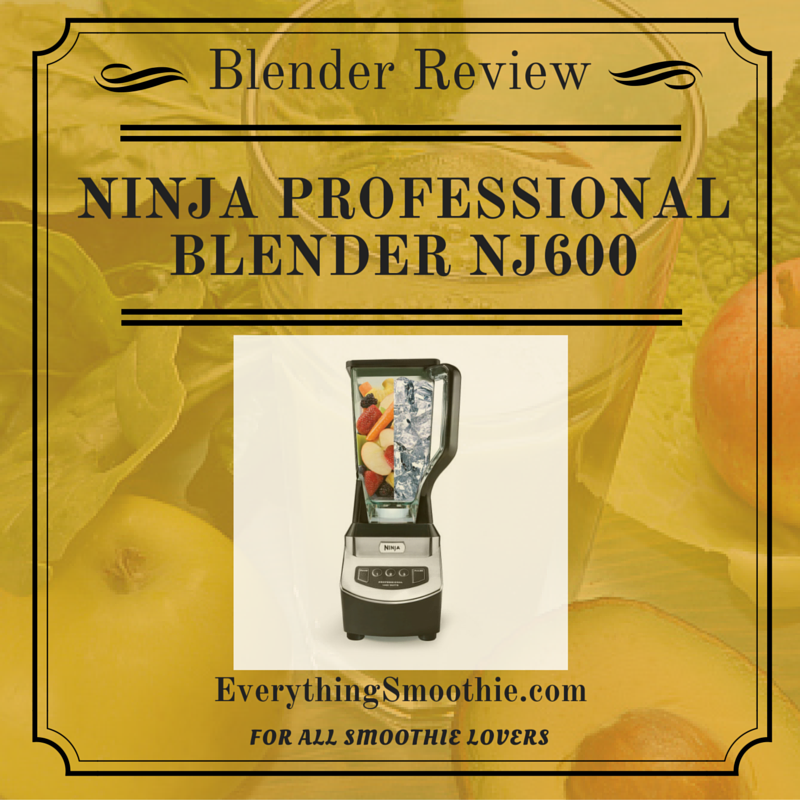 In Amazon, the Ninja NJ600 is one of the most reviewed blenders with thousands of reviews. That’s a huge amount of review for the blender section, showing how popular this product to customers. While the Ninja NJ600 is not the best blender out there, it is the most cost-effective blender that can deliver the power you want to blend your smoothies. A few drawbacks is the short warranty period (only 1 year. But hey, it is more affordable and it will not mix your smoothies as smooth as what a Vitamix or BlendTec will do. But again, I would like to stress that with it’s price, it is one of the most affordable and powerful blender that you can get.